“The Moonshot Summit was an event that gathered the principals within the oncology industry under the inspirational leadership of Vice President Biden. In my opinion, all politics aside, Mr. Biden portrayed the type of leadership necessary to conduct systematic change to defeat cancer. Historically, he has always been a champion for public health. The summit was based on collaboration and change, and Mr. Biden facilitated an effective initiative to drive those focus topics. On June 29, the Vice President gathered 300 cancer experts and advocates to Howard University. 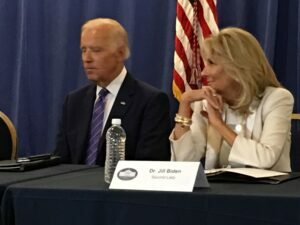 Of the 14 advocates and foundations representing pediatric cancer, all but two were CAC2 members, including both of the people selected to attend the closed afternoon small group working session with Vice President and Dr. Biden. The mission of the National Cancer Moonshot is to accelerate research efforts and break down barriers to progress by enhancing data access, and facilitating collaborations with researchers, doctors, philanthropies, patients, and patient advocates, and biotechnology and pharmaceutical companies. The initiative aims to bring about a decade’s worth of advances in five years, making more therapies available to more patients, while also improving our ability to prevent cancer and detect it at an early stage. Participants from CAC2 observed that the people behind the initiative seemed to be making a sincere attempt to listen to a wide-range of ideas and opinions about what we can do to find cancer cures. They also expressed a uniform desire to guarantee that children, adolescents, and teens were part of the conversation. Our shared hope was that the Moonshot would make a difference and continue into the future. The Summit included multiple speakers and lengthy working group meetings with facilitated focused topics. Comedian Carol Burnett prepared everyone for the day and brought the patient and family perspective to the gathering with grace, warmth, courage, and a dash of humor. When Vice President Biden spoke, he focused on several areas beyond the promised $1 billion of funding that he considered just as critical to achieving progress: federal regulations, drug prices, and the lack of collaboration among medical researchers and institutions. He stated in summary: “We need to change the culture” in today’s research community. Our members attended a variety of working groups, including one devoted exclusively to Pediatric Cancer Research and Funding Issues. The session focused on barriers to progress for drug development for children with cancer. Nancy Goodman began the session by making the case for needed legislative fixes to the Pediatric Research Equity Act (PREA) to give children better access to drugs as they are developed and move through the trial process. According to Frank Kalman, the group also discussed the lack of coordination or cooperation among pharmaceutical company during multi-agent trials and novel funding options. The session on the Voice of the Patient also had CAC2 representation. The overarching concern of participants in that session (mostly representing adult cancers) was the distrust of the doctors, the medical teams, and the testing for adults. This is combined with the struggle of lack of support and education starting at diagnosis and continued throughout the journey. These sentiments were echoed in almost every share regarding adult issues. Surprisingly, insurance did not emerge as large area of concern, and remission was not discussed at all by any of the adult-focused feedback. When the pediatric participants weighed in, they focused on Quality of Life, survivorship challenges, and a responsibility to provide appropriate support for chronic issues and related psychosocial concerns. Another work team, Financing Cures for Cancer, asked participants to imagine a concrete set of actions around financial innovations. These included at least one alternative specifically designed for drug development for pediatric oncology based on creating a de-risked portfolio of compounds in development that might be attractive to pension funds and securities firms investors and might look something like a Real Estate Investment Trust (REIT). This group also brainstormed about a Capital Stack approach that would let investors with different risk/return profiles invest together and mulled over the problem that academic researchers /basic scientists rely on different incentives than philanthropists and investors. 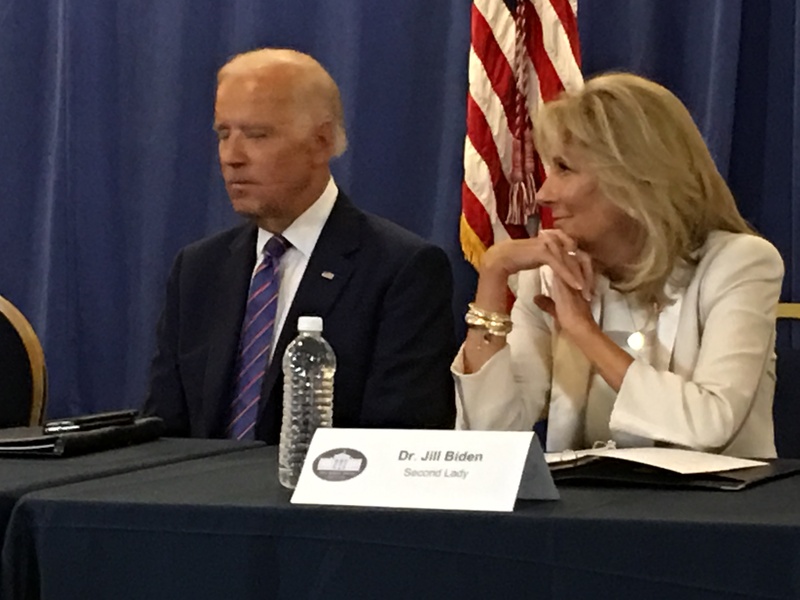 Pediatric advocate participants in the conversation with the Vice President and Dr. Biden quickly recognized that other patient groups cared just as strongly and worked just as tirelessly for the cancer patients they represent, as we do in our community. Yet David Frazer and Vickie Buenger made compelling cases in the meeting that children were different and needed more focused solutions and support because of the dependence they have on governmental funding in the absence of industry funding, because of the many decades of life they face after treatment, where they must carry the heavy burden of the late-term effects arising from their disease and their treatment regimens, and because cancer remains the number one disease killer of children, where in some cases there has been little or no progress in research options or survival rates. They also noted that those gathered and the broader cancer community could learn from the Children’s Oncology Group and from the many examples of collaboration and coalition building long practiced by necessity by children’s cancer community. Along side the work in the governmental channels, organizations of all sizes and missions will use the contacts they have made, the spirit of working together that embodies the Moonshot, and the shared vision of making a difference for cancer sufferers to find ways to breakdown silos, work together, and advance progress more quickly. This opportunity sounds a lot like what we do at CAC2. Thank you so much for giving us a glimpse of what it was like. I hosted a Summit in my local area and I was very curious how things went “at the big one.” I appreciate so much what all of you have done to contribute, with a special note for David Frazer and Vicki Buenger for speaking up for our children, that they do deserve special attention and have been neglected, with regard to Government Funding which was not part of the larger conversation. In our replies and our report for the OVP, we noted that the only question we were to respond to about funding pediatric cancer research was the question of “what greater incentives we could create in the private sector”, which, though important, avoids entirely the issue that has been very upsetting to many parents in the Childhood Cancer Community, that of the 4%. Thank you so much for representing so well the hopes and dreams of us all. Glad we have the strong representatives participating in this promising undertaking. Hope it will carry forth the objectives and changes will be made.